On Martin Luther King Day, Eden and I pulled our “green fingers” out and volunteered for the National Day of Service, organized by Urban Tilth. 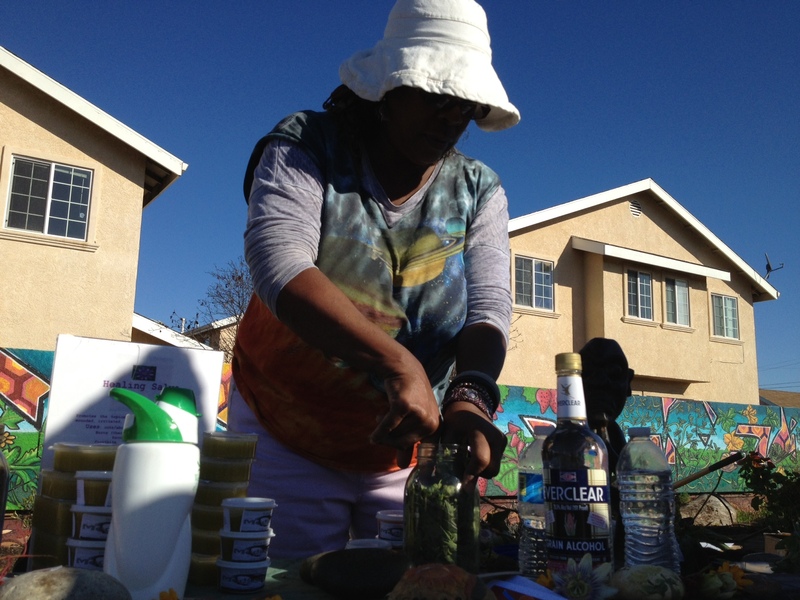 Urban Tilth is a non-profit organization in West Contra Costa County. They help local communities “build a more sustainable, healthy, and just food system”, with the objective of generating 5% of its own food supply. Our Day of Service brought neighbors and volunteers from around the Bay to an oasis in the middle of Richmond’s Iron Triangle. The “Greenway” is a bike/walking path running along part of the former Santa Fe railroad corridor, parallel to Ohio and Chanslor Streets. 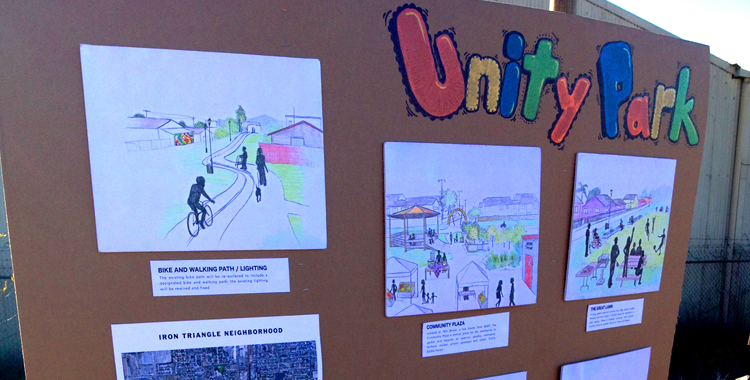 It’s an incredible project that, when finished, will connect the San Francisco Bay Trail with the Ohlone Greenway in El Cerrito. There are many gardening projects packed into its length, including Berryland (approx 20 raised beds filled with over 18 kinds of berry bushes), Greenway Community Garden (42 beds of vegetables and herbs for the community to harvest) and the Greenway Pollinator Garden. 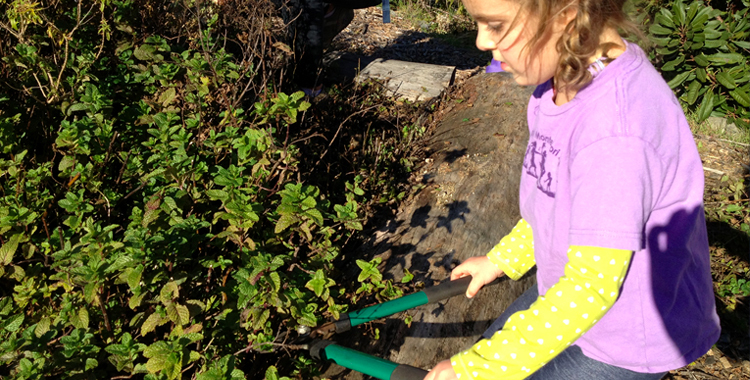 Joining scores of other locals, Eden and I spent time tending the CURME Medicinal Garden–cutting back mint and lemon verbena. The healing garden is used to educate “individuals, families, schools and organizations” about food and medicine, and provide direct benefit to patients with cancer and other illnesses. Founder/Director of the garden is Iyalode Kinney. She paused our volunteer work to demonstrate how a passionflower remedy is made. Leaves and flowers were packed into a jar, steeped in Everclear. Everclear is 75% alcohol and serves to extract and preserve the active plant ingredients. 6 weeks in a sunny site, shaken regularly should result in a natural sedative. We were urged to be cautious with consumption – administering only small drops of the strained end-product. A selection of salves and tinctures were available to purchase at her stall. All around us volunteers were engrossed in projects. A family tended raised vegetable beds, while others suppressed weeds with cardboard and mulch. 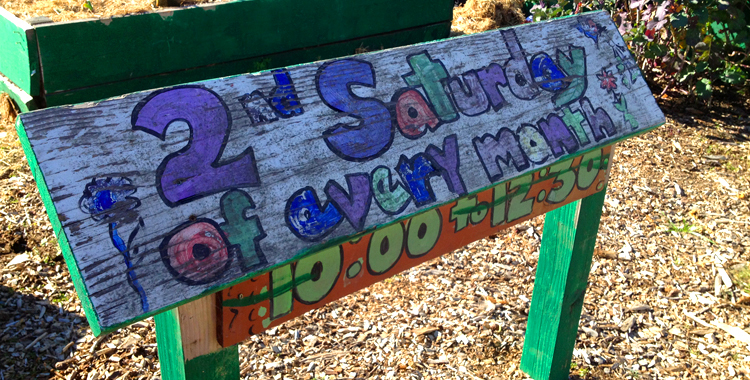 By the end of the event, Urban Tilth had built a market stand, planted trees in the Edible Forest, repaired old garden beds and created new signs and art projects. 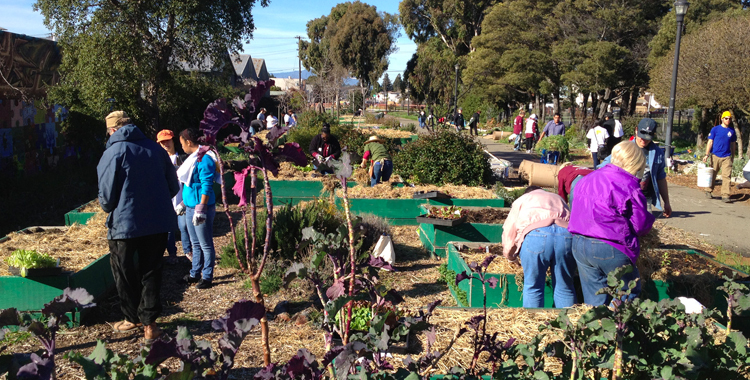 Community vegetable garden, 6th Street. Urban Tilth is committed to giving the community access to vegetables, fruit and herbs–an ongoing effort that relies on continued support. 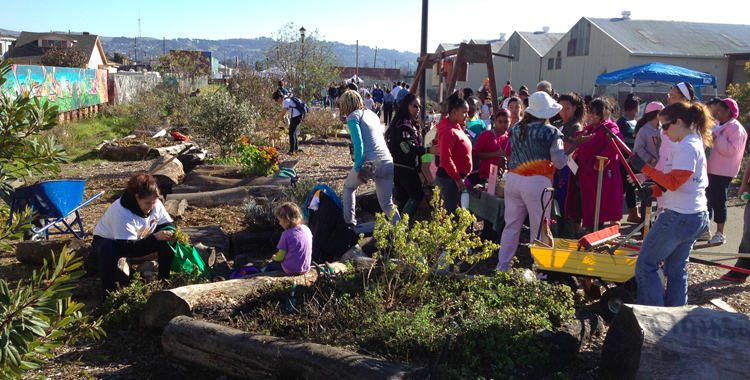 Many people volunteer to keep the garden going (beyond our day of action)–there is always room for more. In addition to gardening, the Day of Service also celebrated the life and work of Martin Luther King Jnr. Live stages graced several intersections of the Greenway, with performances playing into the afternoon. Adding to the fiesta of creativity, people could also take part in art projects headed by Daud Abdullah and MALIK Seneferu. 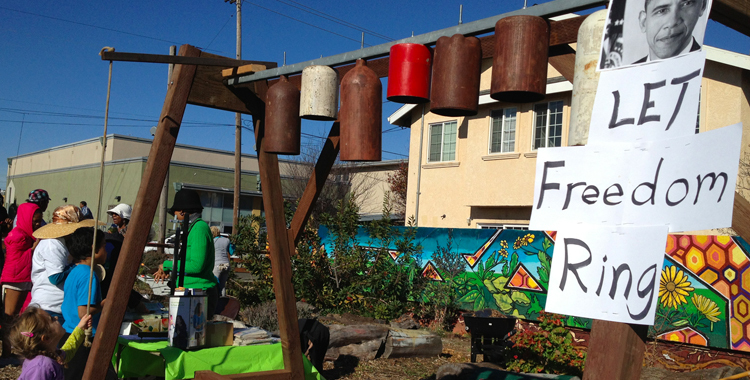 Along the Greenway, stalls detailed community projects being worked on in Richmond. Many tied-in with the Greenway initiative, others supported wider areas of need. What stood out was a vibrant and energetic community, leveraging its creativity and connection to the earth to benefit those around them. The neighborhood spirit was a far cry from the media’s stereotype of Richmond. As we celebrated MLK’s vision, it was clear that the community spirit present at the Greenway stretched way beyond city limits.